"I could talk about skiing and chemistry all day," said Sierra Jech, an ESF graduate student who has combined those passions. Jech is a member of the 2017 Team USA Nordic Ski team that competed in the World University Games in Almaty, Kazakhstan, in February. While there, she conducted research on the environmental and health impacts of fluorinated ski waxes. Fluorinated ski waxes are related to the perfluorocarbons (PFCO) used in creating non-stick cookware. Because the compound repels water it's "extremely useful as a lubricant and helps the skis glide through the snow," she said. She began her research while competing at the 2015 World University Games in Slovakia as an undergrad at the University of Wyoming. After analyzing snow samples from the games site, she was able to detect fluorocarbons -which are known to be carcinogenics with long-term exposure - in the samples. Scientists are concerned that ski waxes contribute to the build up of fluorocarbons in the flora and fauna of the Arctic, she said; those concerns are based on one study that looked at possible links between the environment and ski waxes. "It is simply understudied, so it's hard to know what the actual concern should be around these waxes," she said. Her work in Kazakhstan took a different approach. "To really make this work applicable to the ski community, I wanted to address the fluorinated wax bans and the public debate surrounding them," she said. She interviewed ski wax technicians, coaches and athletes regarding any concerns about human and environmental health in connection to the fluorinated waxes. Ski waxes are applied by heating them at high temperatures, which causes the molecules to vaporize, and can be inhaled by the technicians applying the wax, she said. Some waxes have been banned in the United States and Canada while manufacturing of the compounds has been banned in some European countries. "There is no current research on the effects the specific ski compounds have had on the environment," she said. "There is significant evidence of direct human health risk to wax technicians who spend four-plus hours at a time breathing these compounds," she said. "The risk is mostly acute respiratory damage." Technicians use respiratory masks, but the risk has been deemed significant enough to cause fluoro-bans in many ski conferences throughout the United States, she said. "The amount that ski waxes contribute (to the environment) would be miniscule," she said. "However, if these volatile compounds are a concern in the Arctic (far from sources), then it is reasonable to also investigate local contamination near ski venues." "The goal was to clarify the environmental risk with the data from Slovakia and link it directly to opinions from a large-scale international event in Kazakhstan. This would add real evidence to the fluoro-ban debate, which currently includes mostly speculation and little evidence," she said. Jech found while most people were familiar with the health concerns connected to the waxes, they were unaware of the potential for environmental problems. "Some coaches plan to continue the practice to use all the different waxes and others care about human health and support the ban," she said. There are also interesting socio-economic reasons for ski wax bans. "One argument for fluoro-wax bans is that they are expensive and result in a socio-economic divide within the ski community," she said. "Fluoro-bans help to level the playing field and put the focus on coaching athletes instead of the quality of the ski wax." "I'm hoping to publish in a publication aimed at the skiing community," she said, but for now research on the waxes has come to and end. Chemistry wasn't the main focus of her trip to Kazakhstan. "The World University Games is second only to the Olympics," she said, "with athletes having to prove they are registered in college coursework. The organizers emphasize scholarship equal to athleticism." 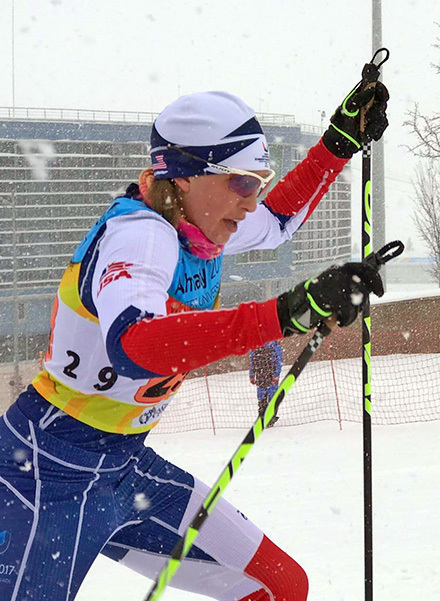 Jech qualified for the team based on her racing results from the 2015-16 ski season. Because she is not associated with a collegiate ski team, she was selected for Team USA as an independent. There are two techniques in the sport - classic and skate. Athletes must be able to do both. There are also sprint (1 kilometer) and distance (up to 30 kilometer) races. Most athletes compete in both types. Despite having not raced this year prior to the games, Jech was pleased with her performance. In the sprint, she finished 50th out of 54 racers, in the 5K skate race, she was 55th out of 62 and in the mixed-team sprint the team finished 22nd out of 29. "Overall, Team USA had its strongest showing at the games so far," she said. Without a Nordic ski team nearby, Jech trained on her own. "Syracuse has proved to be a wonderful place to train," she said. "In the early fall, I was running a lot of state and city parks. I also was able to compete with the SU Triathlon Club." Weight training, roller-skiing, biking and yoga round out her six-day a week training schedule. "I have practiced balancing skiing and school since sixth grade," she said. "At this point, sport is the only thing that gets me through school, and school gets me through the boring training days. When I'm not able to train, I can't study as efficiently. It can be hard, but by now I know that I wouldn't be a successful student if I didn't make room for physical exertion to give my brain a break. It just takes some planning and good time management to get it all accomplished."